Announcement We will be closing our Etsy store soon (approximately May 1st). All orders will be sent out before closing. We'll continue to provide support at our website www.syrcstyle.com and by email at info [!at] syrcstyle.com. Rest assured, we are a registered online business for over 5 years - Syrc Style LLC! Shop at www.syrcstyle.com for more selection! We will be closing our Etsy store soon (approximately May 1st). All orders will be sent out before closing. Saint Florian. Firefighter Gift. Maltese Cross. 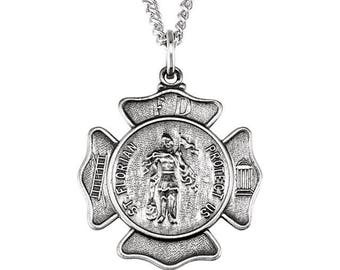 Firefighter Necklace. Guardian Angel Necklace. Protection Necklace. 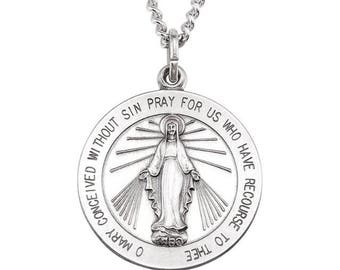 Christian Necklace. Ordered this for my husband for Christmas and he absolutely loved it! Seller was very easy to work with and communicated well! Stylish Custom Jewelry, Temporary Metallic Tattoos, Handmade Handbags, and Much More! Syrc Style started as an accessories shop but due to the popularity of our custom handmade jewelry we decided to shift our focus there. From name necklaces to monogram necklace to custom rings to uniquely engraved jewelry to laser cut necklace to custom bracelets, we pretty much have a little of everything. Each jewelry item is custom handmade to order. Custom pieces are special because they were made specifically for you. Even our featured non-jewelry items are handmade! And we always back the quality and overall awesomeness our your products. We also sell other accessories such as handbags, scarves, temporary metallic tattoos, hats, etc. As the owner Crystal assist with all aspects of the business from designing to marketing to customer service to production to shipping....she pretty much does it all! Mike assist with operations for the store. Welcome to syrcStyle where we sell fine jewelry for every style and occasion! Our goal and top priority is customer satisfaction however items are custom made to order therefore can not be returned. We will accept any returns due to errors on our behave. You must contact us within 7 days of delivery of the item. We will use the tracking number to verify the delivery date. Upon confirmation, we will pay for return shipping, send the corrected piece, or provide a full refund. Please do not send back your item without contacting us first. We are not responsible for lost or returning items due to unauthorized returns. Please make sure your name or word is spelled correctly. Each piece is made to order therefore cannot be resold due to misspellings or errors. Every package we send has a shipping tracking number. We guarantee that your package will be delivered to the address you provided to us. If your package is lost by the carrier, we'll replace it at no additional cost to you. The tracking number is our proof of delivery. If we can't confirm delivery through this tracking number, your package will be considered lost and we will send you a replacement of your order at no cost to you. If the carrier has proof of delivery, yet you say that you did not receive your package, you must file a claim directly with the carrier. This guarantee does not cover replacement of items damaged by incorrect handling or carelessness. 1. We can resend the package with an additional shipping charge; we will not ship again for free. We must collect payment before we resend the package. If we don't hear back from you, we will follow option 2 below. 2. We can issue a refund for your order less a 20% restocking fee. We are not responsible for "rejected or "return to sender" packages. In this case, packages will be forfeited unless the customer pays for reshipment. If you have any questions or concerns please contact us. You will receive a reply within 24 hours. We accept all major credit cards through Etsy secure platform. Do feel comfortable using your credit card directly? We also accept all credit card and checking account payments are accepted through PayPal. Cancellation: Orders are placed in the queue for production after receipt of payment. We can cancel orders within 1 hour after placement, after that we can not cancel your order for any reason. Contact us immediately for a cancellation request. Please wait for written confirmation that your order has been canceled. Sending a cancellation request does not constitute a cancellation. All orders are processed almost immediately. Jewelry is made to order. Most shipment next business day or within 3-4 business days, however, some may take longer to produce. Once shipped, transit takes 2-6 days. This is a general shipping range, please refer to listing for exact shipping times. Delivery time may vary during the holiday season. Please take this into consideration before ordering if the item is needed by a particular time. Don't hesitate to contact us with questions. Signature is required for orders over $150. Depending on which warehouse your item ships from we ship USPS, FedEx, or DHL. A tracking number will always be provided. If you are interested in Expedite Shipping please contact us for a quote and special listing. *Expedite may not be available during the holiday season. *For international shipping we suggest using a mail forwarding service such as USGoBuy (http://www.usgobuy.com/) or Bongo International (https://bongous.com/). You will receive a US address from the forwarding company and packages are sent to that address for forwarding to your country. Please note, we are in no way affiliated with or endorsing USGoBuy or Bongo International. This is just a suggestion; other companies provide similar services. Do research and use at your own risk. If you have any questions or concerns please contact us. You will receive a reply within 24-48 business hours. The price of an item may change at any time due to promotions, stock, or trends. Price adjustments are not offered. We're not able to adjust prices or offer a refund or credit for the difference in price. Promotional code must be provided at the time of the transaction. In the event a product is listed at an incorrect price due to typographical error or error in pricing information received from our suppliers, Syrc Style shall have the right to refuse or cancel any orders placed for product listed at the incorrect price. Our Store shall have the right to refuse or cancel any such orders whether or not the order has been confirmed and your credit card charged. If your credit card has already been charged for the purchase and your order is canceled, Our Store shall immediately issue a refund to your credit card. All product descriptions are subject to personal interpretation. All colors may look slightly different depending on your monitor display settings.